NORWOOD, Mass. 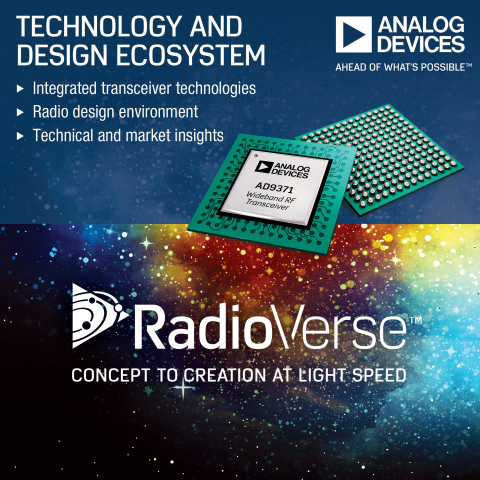 — (BUSINESS WIRE) — May 23, 2016 — Analog Devices, Inc. (ADI) today unveiled the RadioVerse™ technology and design ecosystem, which provides customers with integrated transceiver technologies, a robust design environment, and market-specific technical expertise to move their radio designs from concept to creation quickly. The new ecosystem’s transceiver technologies reduce radio size, weight and power (SWaP), while the design environment offers board support packages, software and tools to help customers simplify and accelerate radio development across a range of applications including wireless infrastructure, aerospace and defense electronics, and electronic test and measurement. RadioVerse is redefining radio design at the circuit, architecture, system and software levels to simplify integration and speed customers’ time-to-market.